It’s been a wild and exciting ride to see the Guild Wars 2 competitive scene grow from community-organized tournaments, to the ESL Go4GuildWars2 Cups, all the way to this year’s World Tournament Series in which players were given the chance to compete for cash prizes and glory around the globe. Over the past year, we’ve created some unforgettable memories and have seen the popularity of Structured Player vs. Player grow at an explosive rate, securing itself as the fastest-growing area of Guild Wars 2. With the momentum from last year’s successes driving us forward, we’re excited to announce that we’re taking competitive play to the next level by partnering with the Electronic Sports League to bring you the ESL Guild Wars 2 Pro League! In the ESL Guild Wars 2 Pro League, eight teams from each region will compete for a combined prize pool of $400,000 USD over the course of two action-packed, seven-week seasons. Each season will ultimately lead up to our Season Finals event that will feature the top two teams from North America facing off against the top two teams from Europe. At the conclusion of each season, all North American and European teams are guaranteed winnings from the $200,000 USD prize pool for that season. But wait—there’s more! At the end of season two awaits the Guild Wars 2 World Championship event with our largest tournament prize pool to date. Sounds exciting, right? Don’t get ahead of yourself—you need to make it into the league first! Four of the eight team slots per region will be up for grabs in the open qualifier. The other four slots are reserved for World Tournament Series finalists and high-ranking teams from the October Go4GuildWars2 Cups, which you can still participate in on October 18 and 25. These cups do not have age or region restrictions. See more details here. In an effort to make the Pro League as competitive as possible, we are lowering the minimum age requirement to 16 years old. Additionally, we will no longer require players to be citizens of any particular country to compete—all are welcome. What If I Don’t Make the Cut? Don’t despair. While we were designing this system, we strongly felt that there should be a clear and concise path of progression for any team to attempt to make their way into the Pro League. Now that the Pro League has been announced, we can talk to you about the Guild Challenger League, formerly known as the Guild Team Leaderboard in previous blogs. The first step to making it into the Pro League is to dominate the Guild Challenger League during regular PvP League seasons. At the end of each Pro League season, the bottom-ranked Pro League teams will have to prove to their fellow competitors that they have what it takes to compete at the highest level. They will face off against the top teams from the Guild Challenger League in the Challenger Cup, risking possible removal from the Pro League. The top teams from the Challenger Cup will then be promoted into the next season of Pro League for their region. This system gives anyone who plays Guild Wars 2 PvP a shot at the top—so get your team together, practice, play in ranked play during a PvP League season, and get ready to give the top teams hell. Now that we’ve announced all the parts of leagues, we want to take a moment to put it all together. The Pro League, the Guild Challenger League, and the PvP League all run in parallel at the same time during a season. The PvP League provides individual challenges and rewards. The Guild Challenger League provides that next step in which a team of players can compete during a league season for guild rewards, prestige, and a shot at going pro in the Pro League. The Pro League offers players the highest level of competitive play for cash prizes and entrance into our World Championship. However, there is one final piece to this picture that we have not yet discussed—balance. We strongly believe that regular balance updates are one of the key pillars of building a successful competitive game. As such, prior to each season, there will be a balance update. League play will generally begin about two weeks after a balance update to ensure that the metagame has stabilized in an appropriate manner. Balance will be closely monitored throughout the season with the goal of having solid balance going into the postseason tournaments. The ESL Guild Wars 2 Pro League is a momentous occasion in the evolution and growth of Guild Wars 2 as a competitive game. We’d like to thank all of our players, shoutcasters, admins, analysts, and everyone in our amazing community for making this possible. We can’t wait to see where this goes, and we look forward to seeing you during our first season. You’ll be able to follow along with the progress of the Pro League at www.twitch.tv/guildwars2. 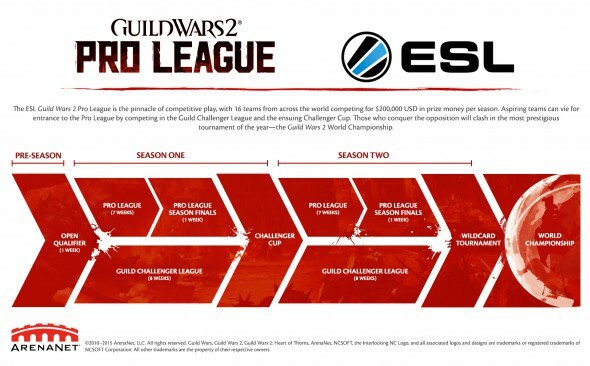 For more information on how you can get involved in the ESL Guild Wars 2 Pro League, click here. Don’t forget to stay tuned to the official Guild Wars 2 site for updates on the open qualifier and the Pro League!